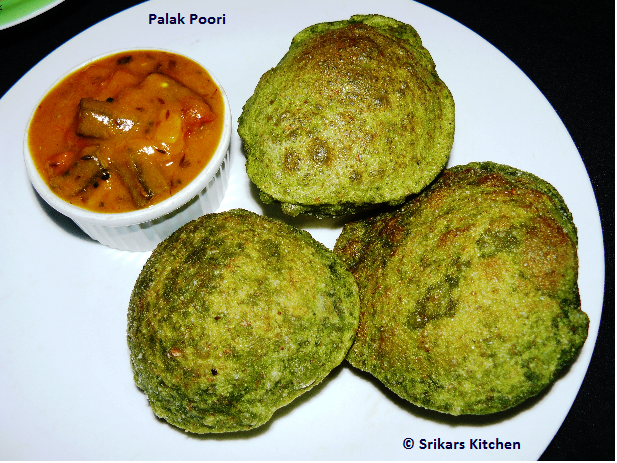 Palak poori- I made this poori for my lovely daughter. She loves poori but not veggie. so i prepared palak poori for her. she loved it. Boil the water in a pan, add palak & allow to boil 3 mins & drain it . Allow it to cool & squeeze the excess water & grind to a fine puree. Take a bowl Add wheat flour, salt, ground spinach & mix well. Add little water & make a soft dough. Allow to rest min 20 mins & Heat oil in a pan. Make the small balls in a dough, dust the flour. Using rolling pin, flatten it & deep fry both sides. Serve hot with any subzi. Very healthy poori and love the fresh colour of the palak too. Ya greeny pooris.Kids should eat lot of vitamin A content.Nice da. Tasty, Healthy & Different Colour Product. Love the rich green color. Poor looks tempting.